This module provides the primary interface for programmers and for interactive non-GUI use. It provides five classes corresponding to the JWST instruments, with consistent interfaces. See this page for the detailed API; for now let’s dive into some example code. Additional code examples are available later in this documentation. >>> nc.calc_psf("myPSF.fits", filter='F480M')         # you can also write the output directly to disk if you prefer. >>> nc.calc_psf(display=True)                          # will make nice plots with matplotlib. WebbPSF attempts to calculate realistic weighted broadband PSFs taking into account both the source spectrum and the instrumental spectral response. The default source spectrum is, if pysynphot is installed, a G2V star spectrum from Castelli & Kurucz 2004. Without pysynphot, the default is a simple flat spectrum such that the same number of photons are detected at each wavelength. A pysynphot.Spectrum object. This is the best option, providing maximum ease and accuracy, but requires the user to have pysynphot installed. In this case, the Spectrum object is combined with a pysynphot.ObsBandpass for the selected instrument and filter to derive the effective stimulus in detected photoelectrons versus wavelength. This is binned to the number of wavelengths set by the nlambda parameter. A dictionary with elements source["wavelengths"] and source["weights"] giving the wavelengths in meters and the relative weights for each. These should be numpy arrays or lists. In this case, the wavelengths and weights are used exactly as provided, without applying the instrumental filter profile. A tuple or list containing the numpy arrays (wavelength, weights) instead. As a convenience, webbpsf includes a function to retrieve an appropriate pysynphot.Spectrum object for a given stellar spectral type from the PHOENIX or Castelli & Kurucz model libraries. To calculate a monochromatic PSF, just use the monochromatic parameter. Wavelengths are always specified in meters. If these options are set, the offset is applied relative to the central coordinates as defined by the output array size and parity (described just below). For coronagraphic modes, the coronagraph occulter is always assumed to be at the center of the output array. Therefore, these options let you offset the source away from the coronagraph.  Space-based observatories don’t have to contend with the seeing limit, but imprecisions in telescope pointing can have the effect of smearing out the PSF. To simulate this with WebbPSF, the option names are jitter and jitter_sigma. In the latter example, you will in fact get an array which is 1024 pixels on a side: 512 physical detector pixels, times an oversampling of 2. Please note that these parity options apply to the number of detector pixels in your simulation. If you request oversampling, then the number of pixels in the output file for an oversampled array will be fov_npixels times oversampling. Hence, if you request an odd parity with an even oversampling of, say, 4, then you would get an array with a total number of data pixels that is even, but that correctly represents the PSF located at the center of an odd number of detector pixels. As just explained, WebbPSF can easily calculate PSFs on a finer grid than the detector’s native pixel scale. You can select whether the output data should include this oversampled image, a copy that has instead been rebinned down to match the detector scale, or optionally both. This is done using the options['output_mode'] parameter. 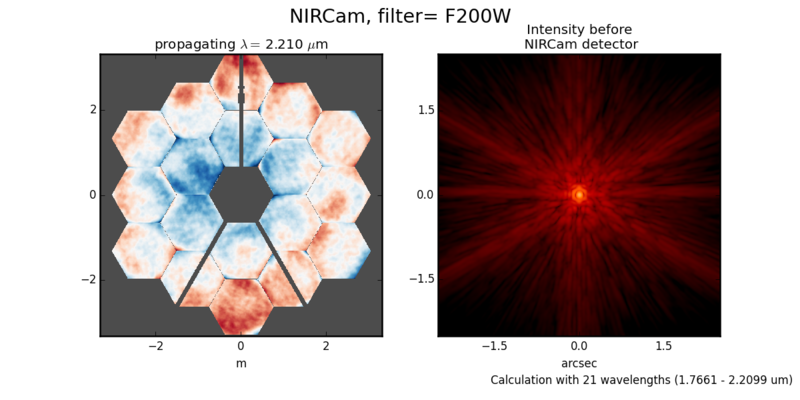 >>> psf2 = nircam.calc_psf()      # now 'psf2' will contain the result as resampled onto the detector scale. >>>                              # the detector-sampled image as the first image extension HDU. The default behavior is both. Note that at some point in the future, this default is likely to change to detector sampling. To future-proof your code, set options['output_mode'] explicitly. The derived instrument classes all know their own instrumental pixel scales. You can change the output pixel scale in a variety of ways, as follows. See the JWInstrument.calc_psf documentation for more details. >>>                                                            # with the PSF rebinned down to regular sampling. For coronagraphic calculations, it is possible to set different oversampling factors at different parts of the calculation. See the calc_oversample and detector_oversample parameters. 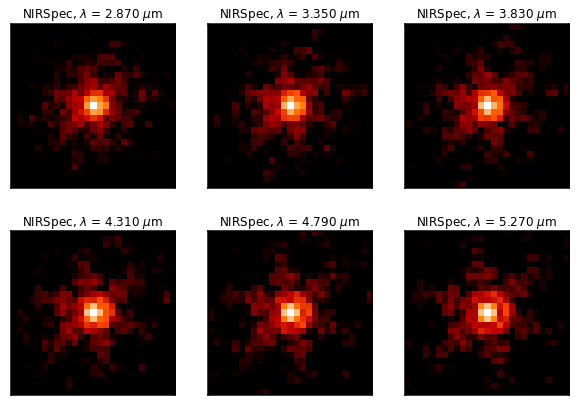 This is of no use for regular imaging calculations (in which case oversample is a synonym for detector_oversample). Specifically, the calc_oversample keyword is used for Fourier transformation to and from the intermediate optical plane where the occulter (coronagraph spot) is located, while detector_oversample is used for propagation to the final detector. Note that the behavior of these keywords changes for coronagraphic modeling using the Semi-Analytic Coronagraphic propagation algorithm (not fully documented yet - contact Marshall Perrin if curious). Or, if you need even more flexibility, just change the instrument.pixelscale attribute to be whatever arbitrary scale you require. Note that the calculations performed by WebbPSF are somewhat memory intensive, particularly for coronagraphic observations. All arrays used internally are double-precision complex floats (16 bytes per value), and many arrays of size (npixels * oversampling)^2 are needed (particularly if display options are turned on, since the matplotlib graphics library makes its own copy of all arrays displayed). Your average laptop with a couple GB of RAM will do perfectly well for most computations so long as you’re not too ambitious with setting array size and oversampling. If you’re interested in very high fidelity simulations of large fields (e.g. 1024x1024 pixels oversampled 8x) then we recommend a large multicore desktop with >16 GB RAM. By default, PSFs are normalized to total intensity = 1.0 at the entrance pupil (i.e. at the JWST OTE primary). A PSF calculated for an infinite aperture would thus have integrated intensity =1.0. A PSF calculated on any smaller finite subarray will have some finite encircled energy less than one. For instance, at 2 microns a 10 arcsecond size FOV will enclose about 99% of the energy of the PSF. Note that if there are any additional obscurations in the optical system (such as coronagraph masks, spectrograph slits, etc), then the fraction of light that reaches the final focal plane will typically be significantly less than 1, even if calculated on an arbitrarily large aperture. 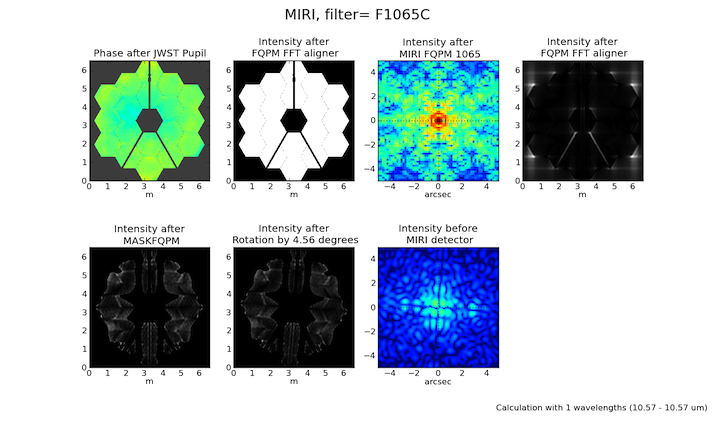 For instance the NIRISS NRM mask has a throughput of about 15%, so a PSF calculated in this mode with the default normalization will have integrated total intensity approximately 0.15 over a large FOV. The above will normalize a PSF after the calculation, so the output (i.e. the PSF on whatever finite subarray) has total integrated intensity = 1.0. The above will normalize a PSF at the exit pupil (i.e. last pupil plane in the optical model). This normalization takes out the effect of any pupil obscurations such as coronagraph masks, spectrograph slits or pupil masks, the NIRISS NRM mask, and so forth. However it still leaves in the effect of any finite FOV. In other words, PSFs calculated in this mode will have integrated total intensity = 1.0 over an infinitely large FOV, even after the effects of any obscurations. An aside on throughputs and normalization: Note that by design WebbPSF does not track or model the absolute throughput of any instrument. Consult the JWST Exposure Time Calculator and associated reference material if you are interested in absolute throughputs. Instead WebbPSF simply allows normalization of output PSFs’ total intensity to 1 at either the entrance pupil, exit pupil, or final focal plane. When used to generate monochromatic PSFs for use in the JWST ETC, the entrance pupil normalization option is selected. Therefore WebbPSF first applies the normalization to unit flux at the primary mirror, propagates it through the optical system ignoring any reflective or transmissive losses from mirrors or filters (since the ETC throughput curves take care of those), and calculates only the diffractive losses from slits and stops. Any loss of light from optical stops (Lyot stops, spectrograph slits or coronagraph masks, the NIRISS NRM mask, etc.) will thus be included in the WebbPSF calculation. Everything else (such as reflective or transmissive losses, detector quantum efficiencies, etc., plus scaling for the specified target spectrum and brightness) is the ETC’s job. This division of labor has been coordinated with the ETC team and ensures each factor that affects throughput is handled by one or the other system but is not double counted in both. To support realistic calculation of broadband PSFs however, WebbPSF does include normalized copies of the relative spectral response functions for every filter in each instrument. These are included in the WebbPSF data distribution, and are derived behind the scenes from the same reference database as is used for the ETC. These relative spectral response functions are used to make a proper weighted sum of the individual monochromatic PSFs in a broadband calculation: weighted relative to the broadband total flux of one another, but still with no implied absolute normalization. WebbPSF remembers your chosen logging settings between invocations, so if you close and then restart python it will automatically continue logging at the same level of detail as before. See webbpsf.setup_logging() for more details. This section serves as a catch-all for some more esoteric customizations and applications. See also the More Examples page. Perhaps you may want to calculate the PSF using oversampling, but to save disk space you only want to write out the PSF downsampled to detector resolution. Your calculation may involve intermediate pupil and image planes (in fact, it most likely does). WebbPSF / POPPY allow you to inspect the intermediate pupil and image planes visually with the display keyword argument to calc_psf(). Sometimes, however, you may want to save these arrays to FITS files for analysis. This is done with the save_intermediates keyword argument to calc_psf(). The intermediate wavefront planes will be written out to FITS files in the current directory, named in the format wavefront_plane_%03d.fits. You can additionally specify what representation of the wavefront you want saved with the save_intermediates_what argument to calc_psf(). This can be all, parts, amplitude, phase or complex, as defined as in poppy.Wavefront.asFITS(). The default is to write all (intensity, amplitude, and phase as three 2D slices of a data cube). If you pass return_intermediates=True as well, the return value of calc_psf is then psf, intermediate_wavefronts_list rather than the usual psf. The save_intermediates keyword argument does not work when using parallelized computation, and WebbPSF will fail with an exception if you attempt to pass save_intermediates=True when running in parallel. The return_intermediates option has this same restriction. Please see the documentation for poppy.FITSOpticalElement for information on the required formatting of the FITS file. In particular, you will need to set the PUPLSCAL keyword, and OPD values must be given in units of meters. Perhaps you want to modify the OPD used for a given instrument, for instance to add a defocus. You can do this by subclassing one of the existing instrument classes to override the JWInstrument._addAdditionalOptics() function. An OpticalSystem is basically a list so it’s straightforward to just add another optic there. In this example it’s a lens for defocus but you could just as easily add another FITSOpticalElement instead to read in a disk file. Note, we do this as an example here to show how to modify an instrument class by subclassing it, which can let you add arbitrary new functionality. There’s an easier way to add defocus specifically; see below. The instrument options dictionary also lets you specify an optional defocus amount. You can specify both the wavelength at which it should be applied, and the number of waves of defocus (at that wavelength, specified as waves peak-to-valley over the circumscribing circular pupil of JWST).